Andrew Robertson's speedy rise in football has stunned youth coaches at the club where his career took off. The 20-year-old left Queen's Park for Dundee United in 2013, before signing for Hull City and scoring his first Scotland goal just over a year later. "Did we see that happening? Never in a million years," said David McCallum, head of youth development at Queen's Park. "Andy would be honest with you and say the very same thing." 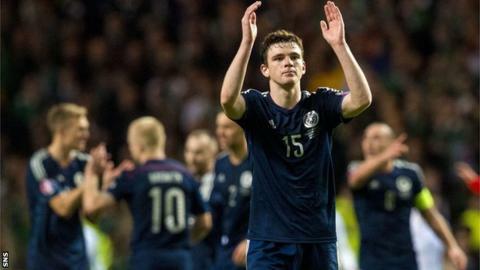 Robertson has gathered five Scotland caps, hitting the back of the net on his most recent outing - a 3-1 defeat to England in November. And that was three months after moving from Dundee United to Premier League side Hull City for £2.85m, where he is already a first-team regular and is receiving high praise from manager Steve Bruce. "You can see why he's got there, there's no question about that," said McCallum. "But there's also no question that you could write a book about it. The fact is, if somebody goes to that level in such a short period of time, it is a fairy-tale story." Robertson, from the south side of Glasgow, joined Scottish League Two amateurs Queen's Park after being released by Celtic. And McCallum stressed that there were no immediately obvious signs that the left-back would flourish in the game. "Truth be told, when he came in, we had two under-17 squads and there was the perception that one squad was the better squad and one was the second squad. "Andrew was in the second squad mainly due to his physical development, not because of talent. "He played with his head up. He asked questions to make sure he was doing the right thing. If he was given information he wasn't sure about, he would come back and get reassurance - that's something that's important with a young player." "Celtic might have had somebody else they felt had a better opportunity to go beyond Andrew. We've done it with players as well, and they leave here and maybe take a step beyond where we felt they would've gone. That's just the way football is. If he was still at Celtic, would he have played as much and be where he is?" In the summer of 2012, Robertson seized his chance to fill the left-back berth previously occupied by Barry Douglas and Daryll Meggatt. "In our system, Andrew was the next prospect," said McCallum, one of several Queen's Park coaches to help the youngster develop. "He was taken to a first-team pre-season gathering and simply didn't look back. It got to a point where Gardner Speirs [manager] couldn't leave him out. "I'm not sure he was taken to Dundee United to be a first choice right away, but Jackie McNamara couldn't leave him out - and now again at Hull. "It's alright having the ability and the talent and the work ethic, but the fact that he's got his mind round each challenge is huge, especially in the modern game." McCallum has been in his current role at Queen's Park for four years, before which he was assistant manager to Billy Stark at Hampden. The former Motherwell, Partick Thistle and Stirling Albion player believes it is "vital" that young players are willing to make sacrifices off the field in order to progress on it. "In Andrew's case, we like to think we've educated him in a football and a lifestyle sense," said the 37-year-old. "Back at that time, and even now, Rangers have got Lee Wallace. If Lee had got a chance to go south and Rangers had taken the opportunity to let him go, then they may have looked at Andrew, but it comes down to what you need. It's easy to criticise clubs for not looking at him or for letting him go, but if they don't need him at that point, only they can make that decision. If he had gone to Rangers, would he have played?" "He comes from a good family as well - his parents are terrific people and very level-headed. "He's still in touch with a lot of his former team-mates at the club here as well, so having those bonds and relationships have been good for keeping his feet on the ground and making sure he lives his life properly. "He's such a high profile now that he has to, because if he doesn't he's an easy target for it to be picked up on. "He's living a dream at the moment and he's living it well."